We bill Puzzled Pint as a friendly, social, puzzle-solving event that’s geared toward newbies (as well as experienced puzzlers, especially if they’re happy to handicap themselves with a few pints). The truth is that Puzzled Pint is slightly less social than we make it out to be. Attendees are social within their team and when interacting with Game Control, but teams rarely talk to one another. Over the years, we’ve employed a few “icebreaker” puzzles. They’ve been few and far between and happened back when it was just Portland and a single Seattle site. This past month, during Wil Zambole’s A-Team set, we had a set of puzzles that required cross-team data gathering and sharing. Wil’s idea gave each team a dossier on one of four A-Team members. Each of the puzzles had a few clues that could only be solved by looking up a personal fact from one of the dossiers. Hannibal’s favorite author. Face’s favorite TV show. Murdoch’s favorite band. B.A.’s favorite flower. Teams had to send a runner out to collect the relevant data. Unfair to early/late teams because there may not be another team present with the correct card. Interruptions during critical solve moments. Accidentally overhearing solve mechanisms from other teams. Artificial bottlenecks that unfairly affect solve times and standings. On the other hand, many in GC thought that a few minor interactions would bring in something new and novel to the night, possibly bringing us back to our more social roots. What GC thinks is one thing, but how players feel about the event is what matters most. We added a Question of the Month to help capture player sentiment: How would you rate the interaction puzzles from 1..10 plus room for comments. When you graph the positive/neutral/negative range of the write-in comments, it shows that a lot of people didn’t mind and that there was a fairly even split between the likes and dislikes. I’m not sure what city-by-city conclusions to draw from that, but thought it would be fun for each city to see how their responses compared to others. What do you think of puzzles requiring social interaction? Have you run into any at a previous event, such as DASH or an earlier Puzzled Pint, that you particularly enjoyed? Although we want to aim for no more than one or two “icebreaker” months a year at Puzzled Pint, how might we improve the player experience for this style of puzzle? DASH 7 is happening soon! Puzzled Pint was founded nearly 5 years ago and DASH was a strong inspiration for our founders. (Alas, I cannot include myself in that group; I joined GC a couple years later.) We try to position Puzzled Pint as a monthly event to help foster a puzzle community in new cities and to act as a stepping-stone to train folks for more advanced puzzle hunts such as DASH. 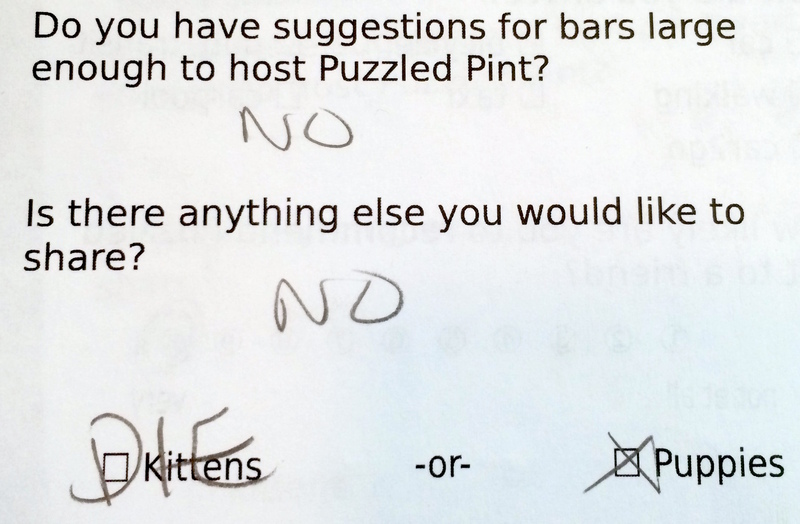 In other words, if you attend Puzzled Pint, you should strongly consider DASH. For those not in the know, DASH stands for Different Area, Same Hunt. It is an afternoon-long puzzle hunt that’s played out in cities around the world. While Puzzled Pint happens on paper, in a bar, DASH involves running (or walking) around your city, and answering puzzles to reveal your next destination. While the majority of DASH puzzles are on paper, there are sometimes more interesting mechanisms — plastic lemons, business cards, tokens, Post-It notes, foam-core board constructions, MP3 players, and so on. DASH can be as competitive or noncompetitive as you want. There are three tracks: one for experienced puzzlers, one for beginners, and one for kids. Time is tracked during solving itself and does not accumulate when walking between locations. Some teams like to run, many prefer to walk at a leisurely pace. DASH 7 is coming soon. From the look of the logo, this one is Harry Potter themed. (I’m so excited!) The event is on May 30th, but registration closes in less than a week, on May 1st. It’s $45 per team, with a team being 3–5 people. It takes place in 16 cities: Albuquerque, Austin, Boston, Chicago, Davis, Denver, London, Minneapolis, New York, Portland, San Francisco, San Jose, Santa Monica, Seattle, St. Louis, and Washington DC. Find out more on the PlayDASH website and on their FAQ. Let’s just go through the answers in order, shall we? Starting with the first, we’ll look at the experience of our players. As you can see, we’re mainly veterans and newbies. This has always been one of our biggest challenges, with regard to both attendance numbers and difficulty. Of course, we want to encourage new members to join the community — that’s one of the core tenets Puzzled Pint was founded upon. On the other hand, the influx of new people have pushed our numbers past 100, making bar scouring extremely difficult. We’ve since tempered this by splitting into Bridgetown and Stumptown sub-groups, each with their own location. The mix also means we have to be careful with puzzle difficulty. We don’t want to scare away the newbies with puzzles above their difficulty level, yet we also don’t want the long-time regulars to get bored. We’ve skirted around this by managing expectations — maybe not going so far as saying “if you think this is too easy, go start your own intermediate-to-advanced puzzle event” but at least by imposing this as a newbie-friendly event. Other events, such as DASH, can produce different sets of puzzles for teams with varying difficulty levels. This is difficult for Puzzled Pint since we print everything ahead of time. We’ve kicked around the idea of puzzles that can be altered post-printing (such as marking flavor text with a highlighter), but so far the idea hasn’t gotten much traction. 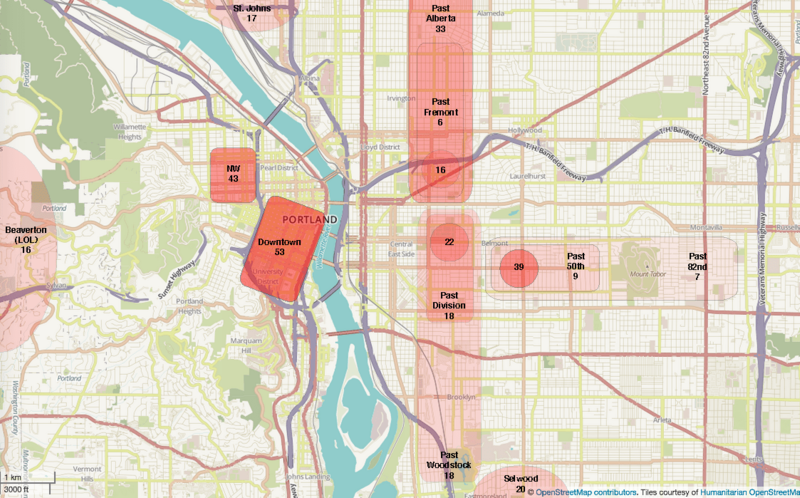 Portland is a small “big city” and our travel distances and methods reflect that. The vast majority of people traveled less than 5 miles and less than half came by car. 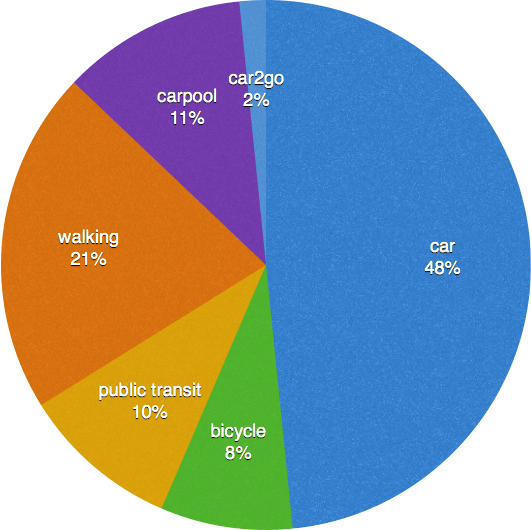 That bikes and public transit were big contributors wasn’t much of a surprise. I was surprised that almost a quarter of respondents walked. 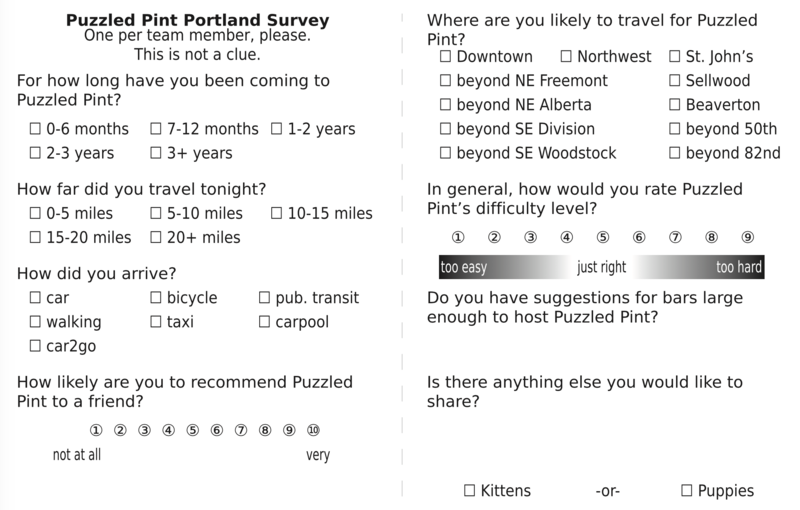 The next question, “how likely are you to recommend Puzzled Pint to a friend” is a traditional NPS survey question. Marketing and support folks may know and understand this number, most folks don’t. Suffice it to say that most organizations do poorly. Beloved companies like Apple, Trader Joe’s, and Amazon do well. 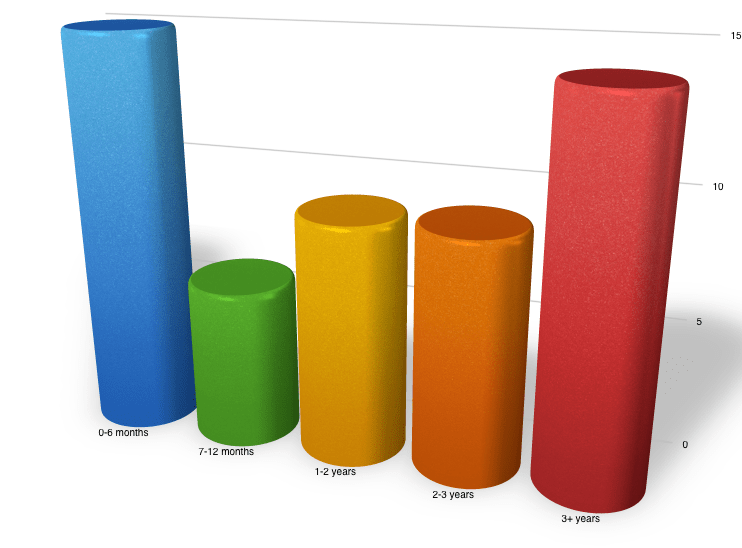 Many companies get close to zero, or even negative numbers. 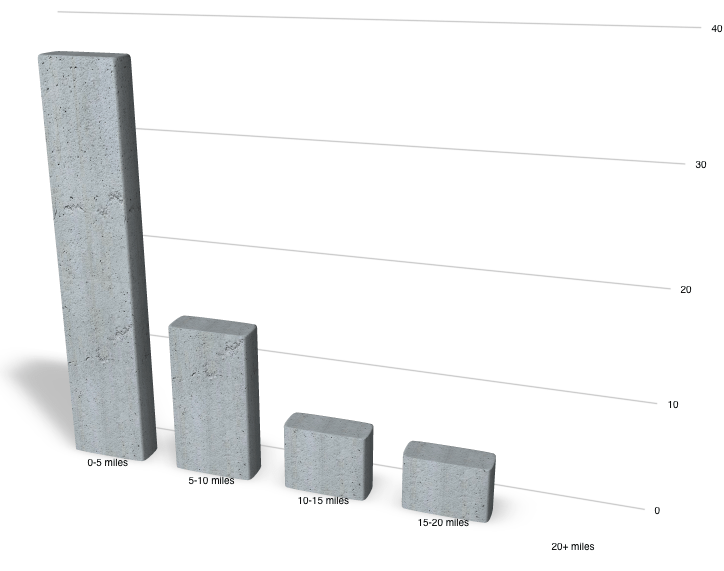 (The scale goes from –100 to 100.) We got a quite reasonable 69. Admittedly, there may be some selection bias here. Only people that took time out of their Tuesday night to come solve puzzles were able to respond, so the folks that don’t like us enough to not show up (and would likely also not tell their friends) would not be represented. The vast majority of responses wanted downtown or northwest, which makes sense. It’s central to everyone. For reasons mentioned above, and despite the numbers, I think we are going to ignore the St. John’s and Beaverton suggestions. Both numbers are much higher than I expected, but our team isn’t terribly interested in the awkward travel. It looks like we probably won’t be going past 50th. The NE and SE quadrants got a lot of hits, though I personally didn’t expect the NE distances to be quite that far out. 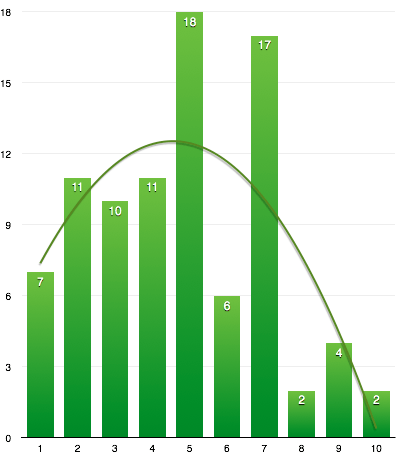 On the difficulty front, we got average-to-intermediate, which is roughly the range we’re trying to hit. A few of the responses singled out some months as particularly difficult in margin notes. 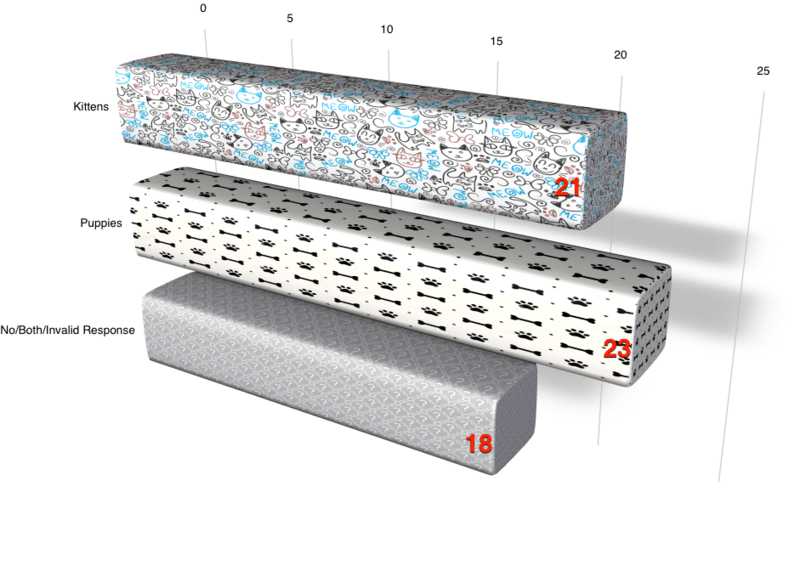 We’ve collated the bar suggestions into a spreadsheet and are actively investigating them during our scouting runs. So thank you for those responses! You’ll see some of those suggestions being used over the next few months. I’d really expected Portland to be a kitten town. Thanks for letting me down, Portland! That’s it for now. These are the simple, isolated stats. I’d like to work out some correlation across questions soon. 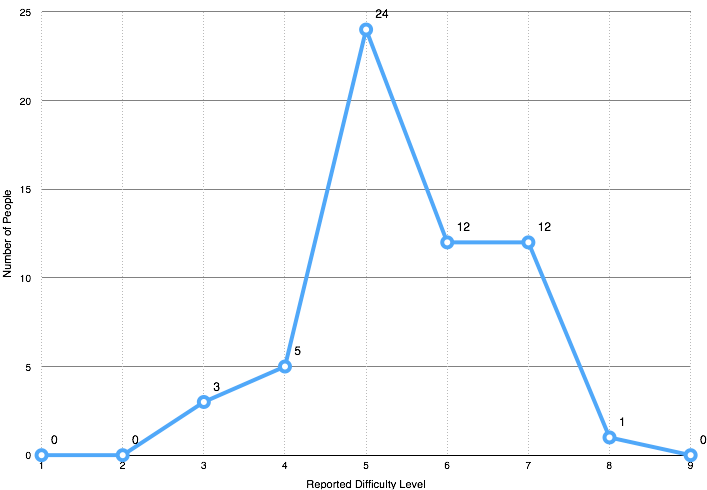 Does your longevity in Puzzled Pint influence what you said for puzzle difficulty levels? 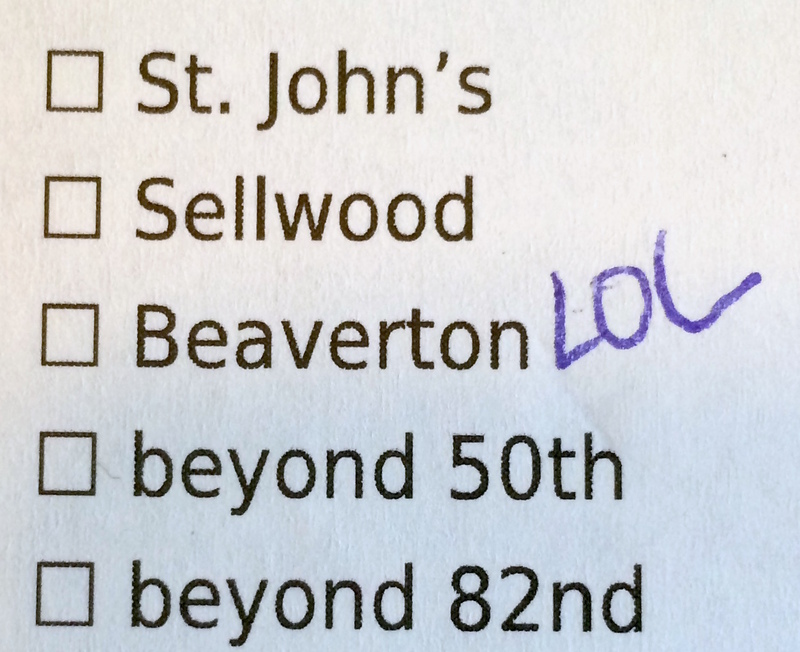 Are the folks with a higher travel distance also the Beaverton and St. John’s voters? Are walkers/bikers predominantly dog people? 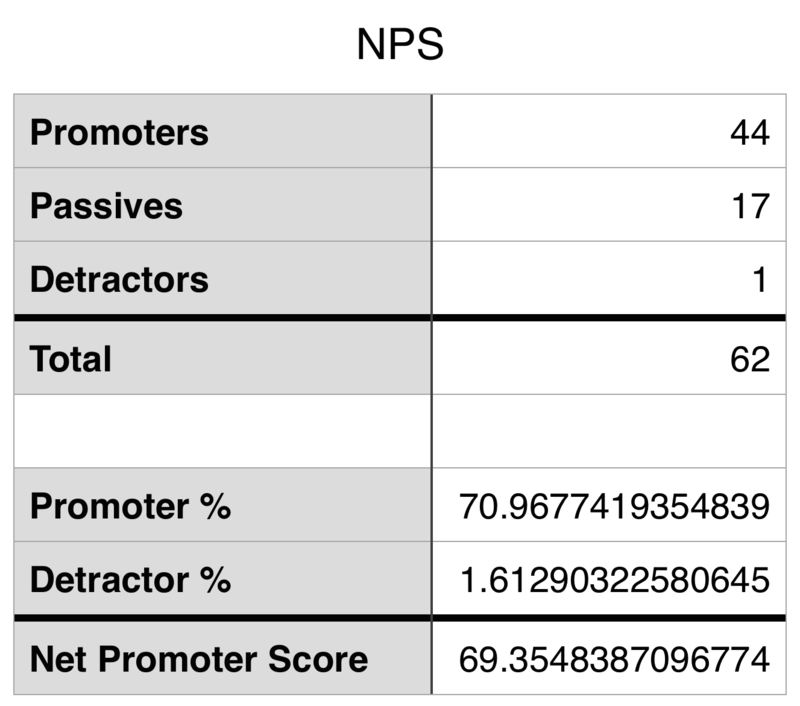 If you’d like to run your own numbers, you can download a CSV of the survey results and go to town. Welcome to the first post of the Puzzled Pint blog. The hope here is to have an informal place to talk about Puzzled Pint, share with you the Question of the Month responses (yes, we have all of them, we’ve just never really published the results), and have discussions — a place without the 140-character Twitter limit and a place that doesn’t require a Facebook login. If you are a Twitter or Facebook person, keep an eye on the global Puzzled Pint accounts (Twitter / FaceBook). 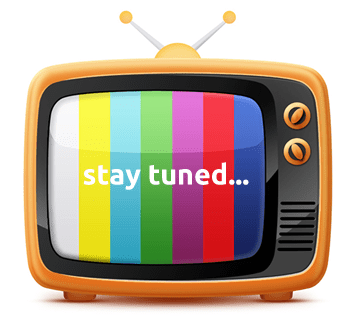 We hope to get cross-posting set up soon so you won’t miss out on the blog posts. If you’re the kind of geek that uses RSS, you may subscribe to our RSS feed. Although we will start with the Portland Game Control staff writing blog posts [okay, probably just me ～Brian], we hope to pull in GC from other cities and possibly even other guest authors. Stay tuned for the next post, where we look at our recent Portland survey results, including — most importantly — the kitten vs. puppy debate. And if you have questions or suggestions for future blog posts, please contact us, either as a comment here or to the game control email address.